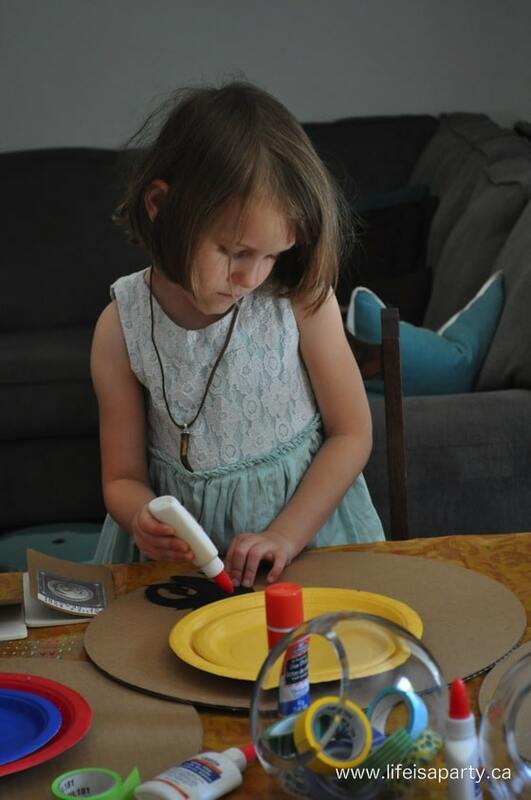 How To Train Your Dragon Birthday Party: Make your own shield, train your dragon stations, sensory table, and dragon training survival loot bags! 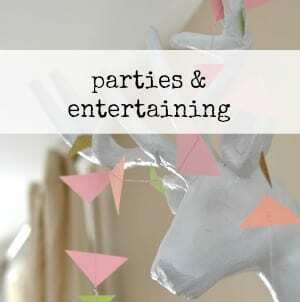 I had the pleasure of celebrating one of my favourite little people turning 5 recently, and wanted to share her amazing How To Train Your Dragon Birthday Party with you. She’s a big fan of dragons -any and all kinds of dragons. She loved both of the How To Train Your Dragon movies. Her Mom Heather planned this amazing party to go with the theme. 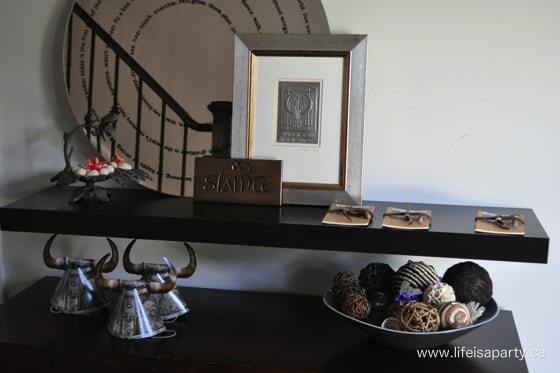 Hopefully it will give you some great inspiration and ideas for decor and activities if you’re planing your own How To Train Your Dragon Birthday Party. 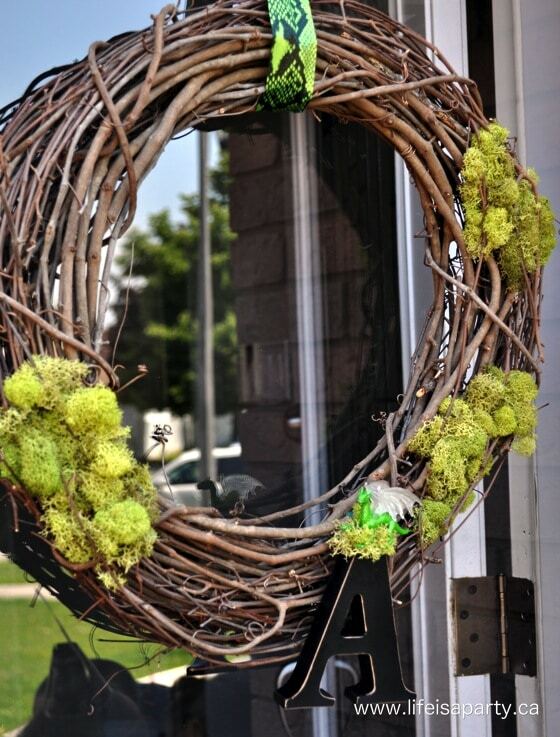 The theme was set as soon as we arrived with this fun wreath. 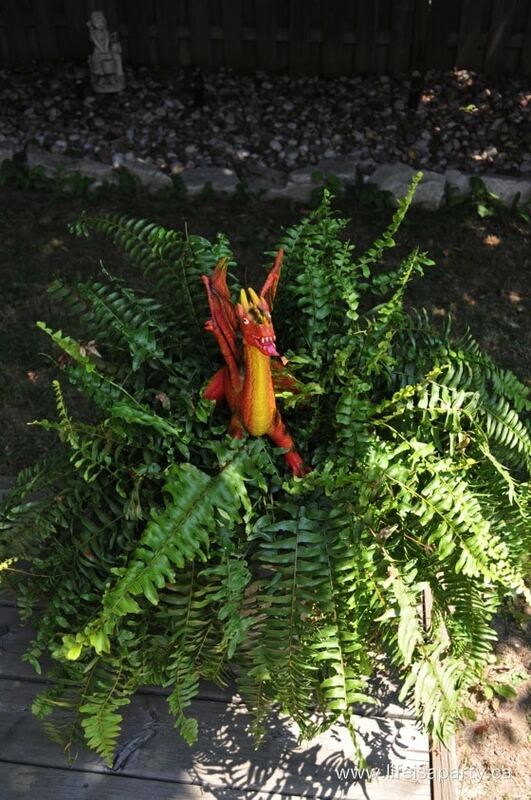 It was decorated with dragon scale ribbon, moss, and a fun little toy dragon making a nest on top of the “A” for Allie. And after the party the wreath moved to decorate her bedroom door. 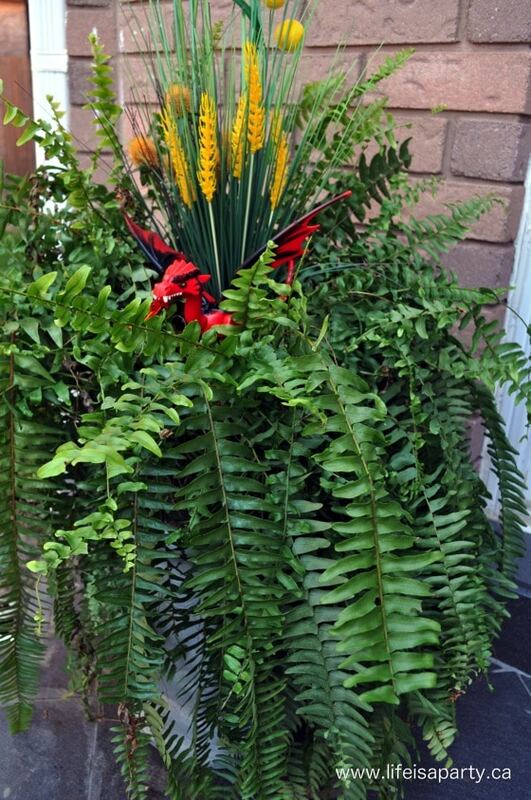 Heather decorated the whole party with lots of ferns. At the front door there was one with a with a favourite dragon toy tucked inside to greet us. At the front door we received our official “book of dragons”. It was a little blank notebook for us to take notes in. 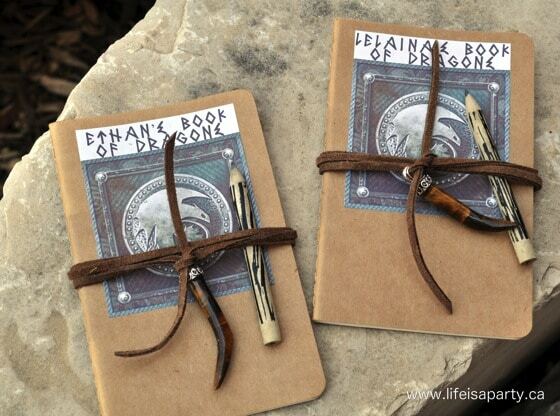 The notebook was wrapped up with some leather and a “dragon tooth” charm. After we unwrapped our books, everyone used their dragon’s tooth as a necklace. Inside we also got our fun little viking party hats -loved them! 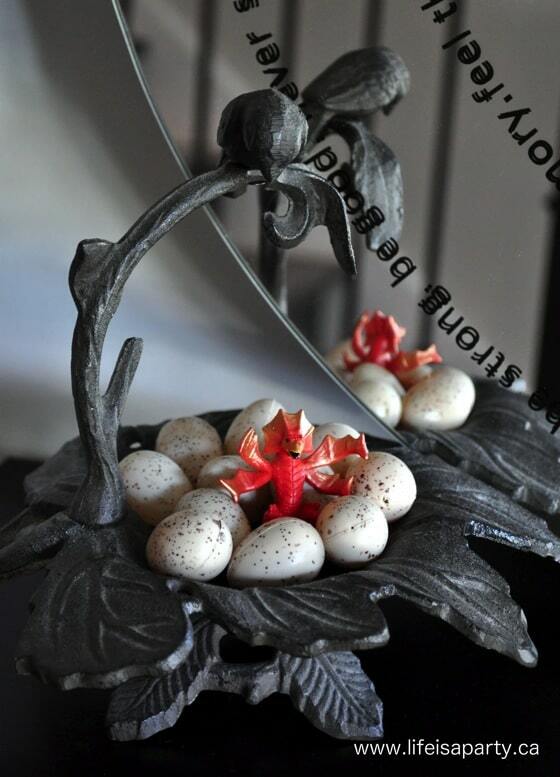 I also loved all the little dragon details around the house. 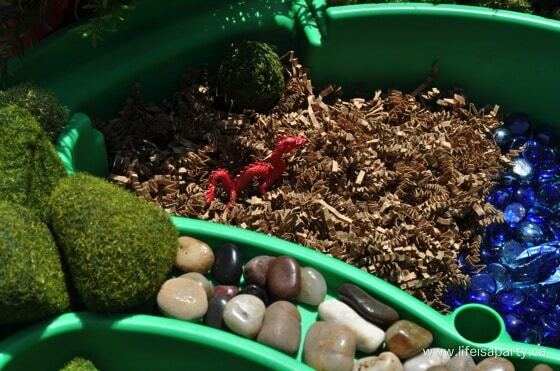 How cute are these dragon eggs tucked into a nest, and one little hatchling? Our first activity was to design our viking shields. 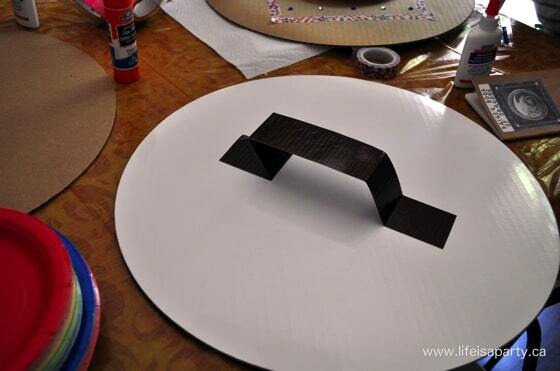 The base of the shield was a simple cardboard cake board -clever! 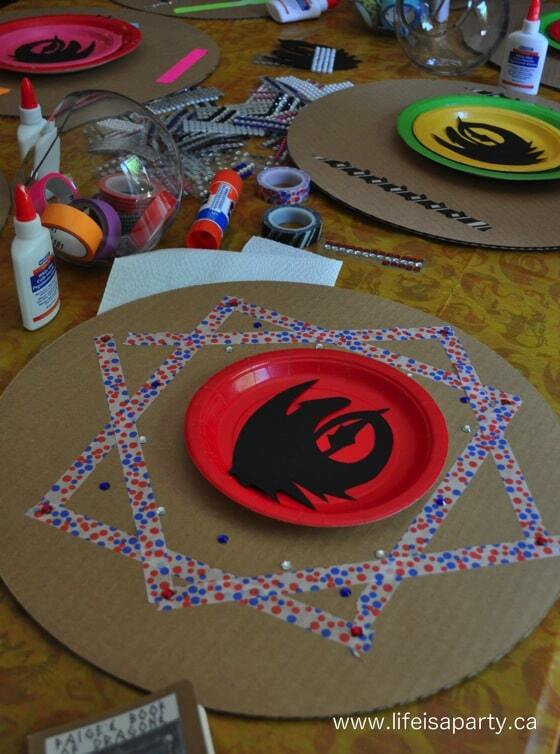 We decorated them with different colours and sizes of paper plates, stick on gems, and washi tape. 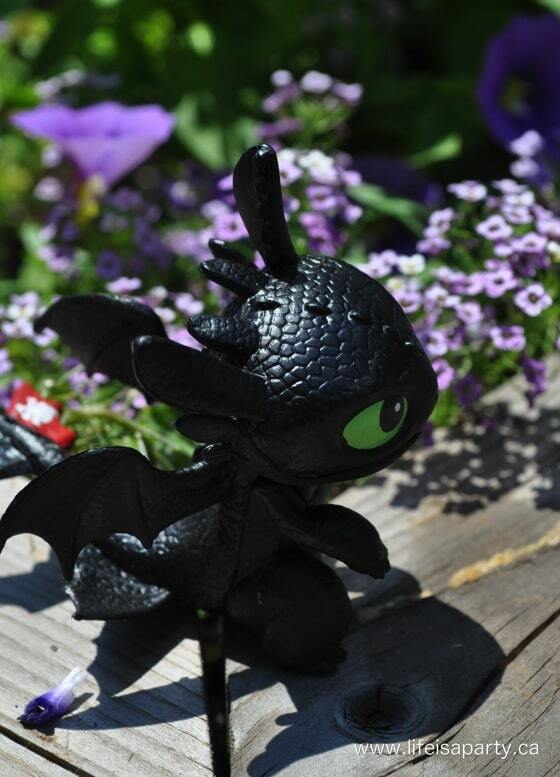 Everyone also got a Toothless cutout for the front. The handles were made out of duct tape on the back. When the Viking Shields were made, everyone received a foam sword. 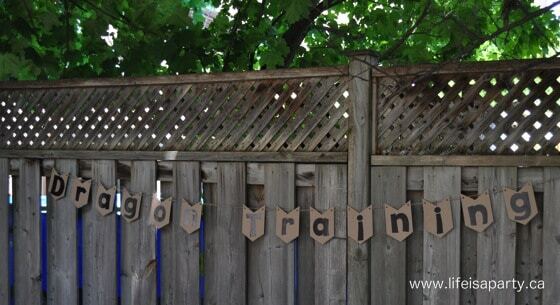 We were all ready to start actually training the dragons in the backyard. 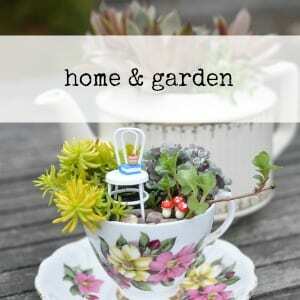 The backyard was full of fun activities for the kids to visit as they wanted to. 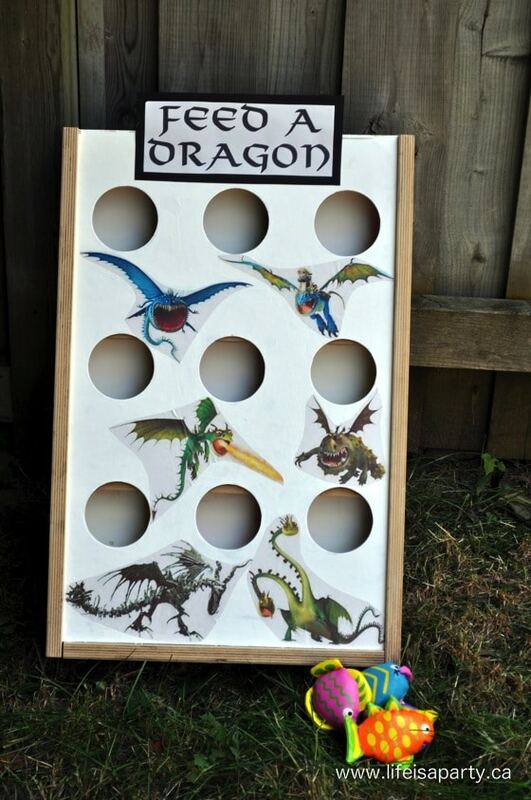 One was a dragon feeding game. Heather used a bean bag toss game she already had, and decorated it with some dragon cutouts from the movie. The kids could throw the fish bean bags in to the holes to feed them. There was also a game to catch the dragons with a small net. 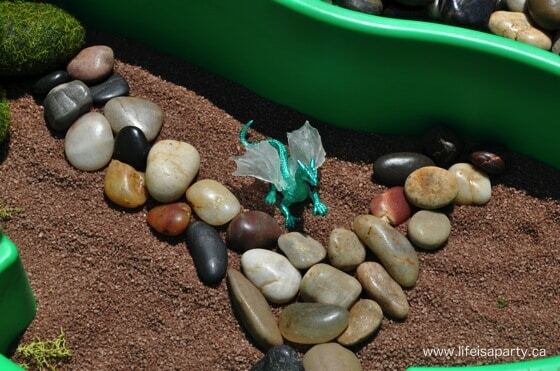 The dragon toys were hidden in the rocks, and there was a small net to use for catching. The favourite activity might have been the flying practice. 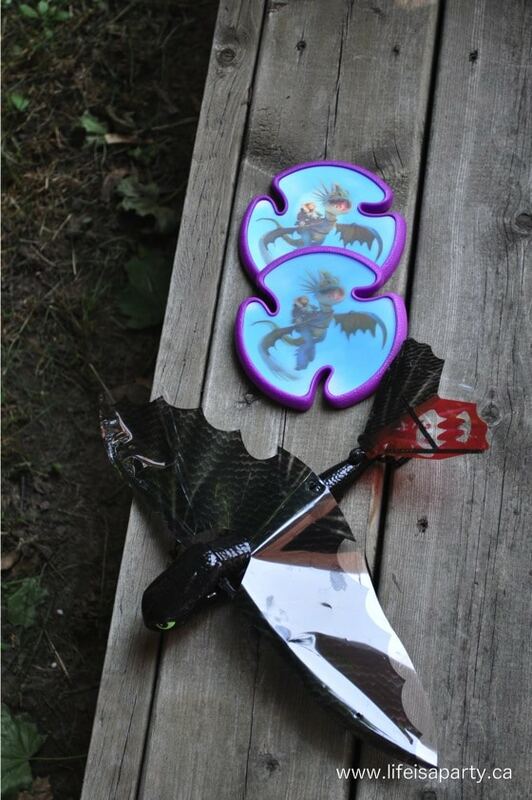 Heather found a flying Toothless toy, and set up a ring of fire for flying practise. 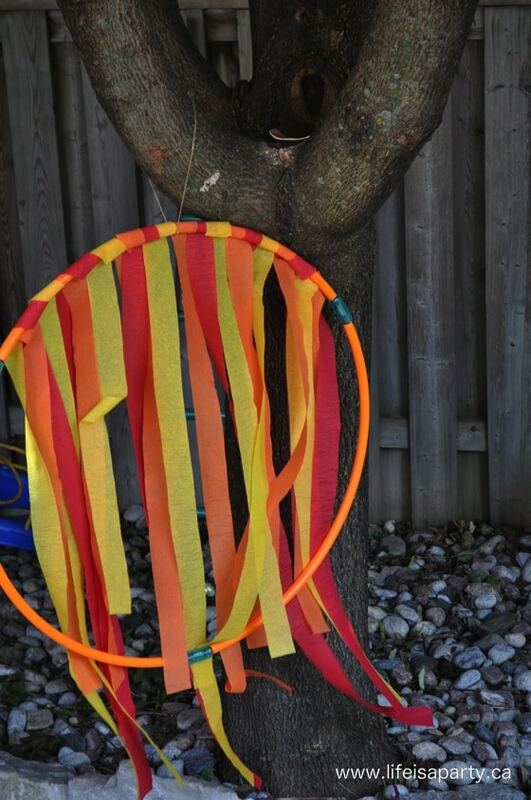 A hoola-hoop with streamers attached was used to create the ring of fire for the kids to fly the dragons through. 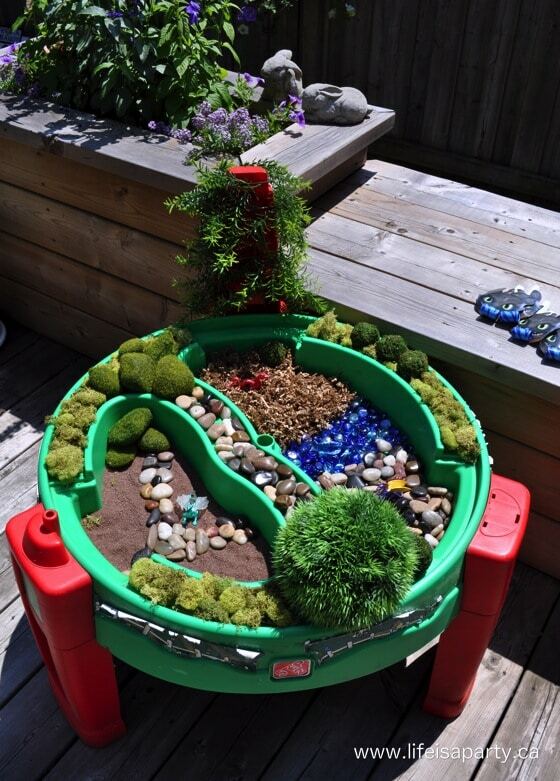 There were also some little ones at the party, so Heather set-up a great sensory play table for them. The kids loved the sensory table, including the bigger kids. 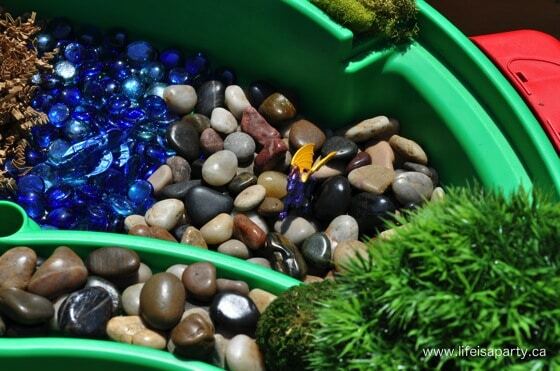 Heather converted her old farm water table, using moss, sand, rocks, shredded paper, blue glass pebbles, and some dragon toys. 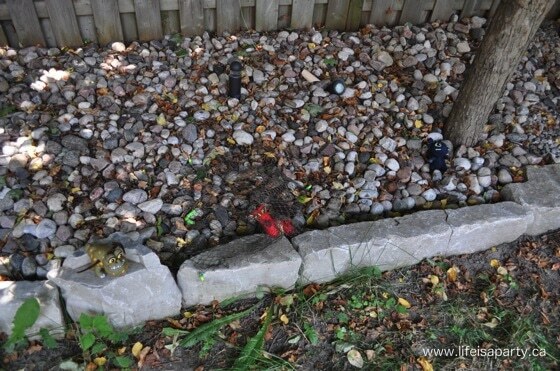 The backyard had lots of little dragon toys tucked all around. One of the final games was for everyone to find their own to bring home with them. 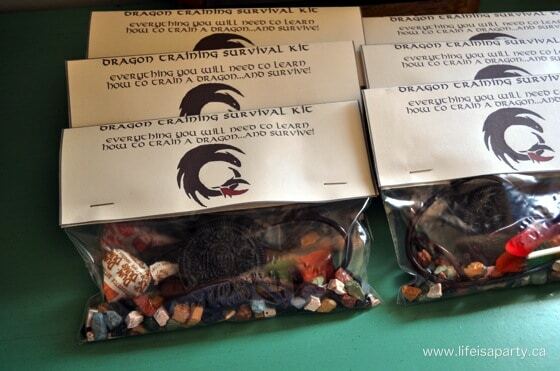 There was also a piñata, and one of my favourite little treats was the Dragon Training Survival Kit. 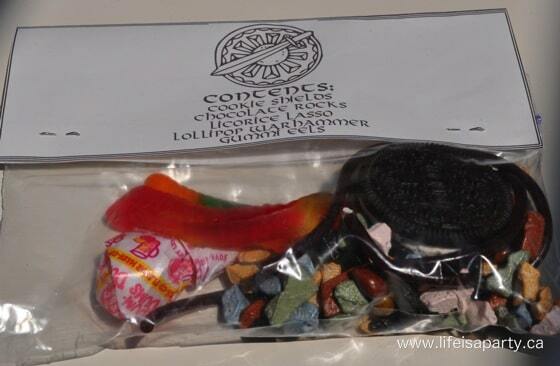 The kit contained a cookie shield, chocolate rocks, a liquorice lasso, a lollipop war hammer, and gummy eels. All the fun details were amazing, and the kids all had so, so much fun. 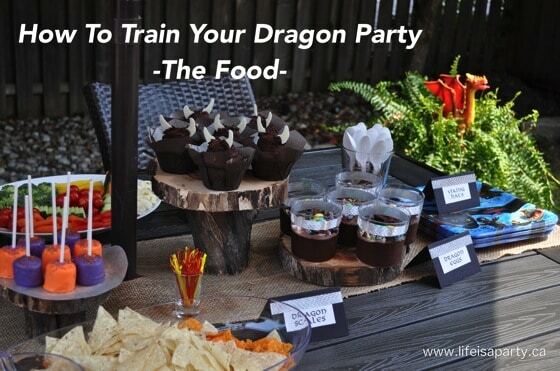 Be sure to check out all the How To Train My Dragon party food ideas here. 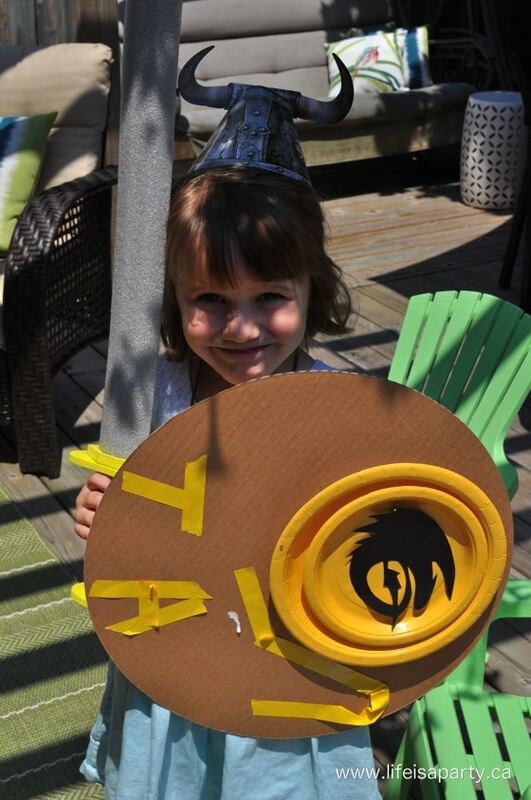 With an amazing How To Train Your Dragon Birthday Party, life really is a party! What a fabulous party. I love the creativity, simplicity with huge FUN impact! This is something I would love to try and replicate, can’t wait to see the party food. I am currently planning a “How to TrainYyour Dragon” party for my 7 year old daughter and I really love your dragon training journals! 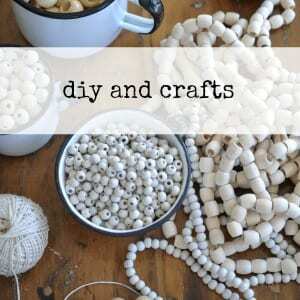 I amwondering if you would be willing to share how you made them. I bet your daughter loved her party. It looks amazing! It was actually my friends party for her little girl, so I’ll ask her about the journal and get back to you. Hope your party is coming together for you. 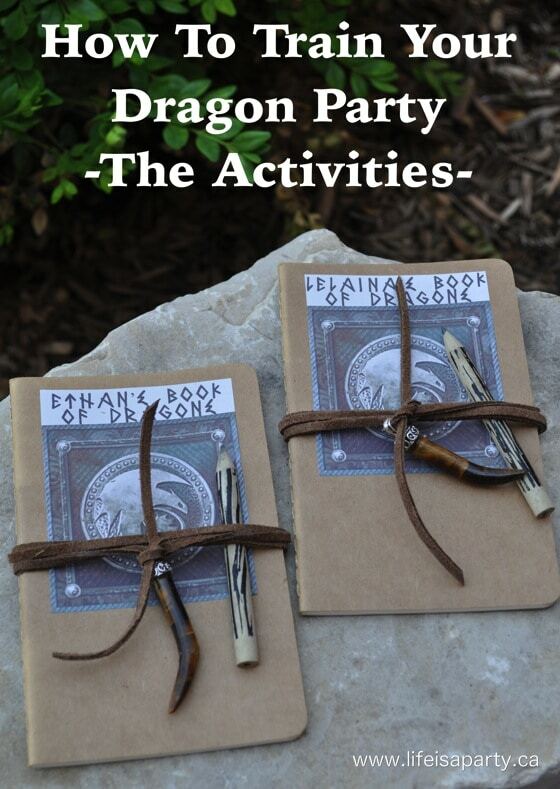 hi I am planning a dragon party and would love your favor bag labels if you would be willing to share. Your party was great! It actually wasn’t my party, it was a friends. 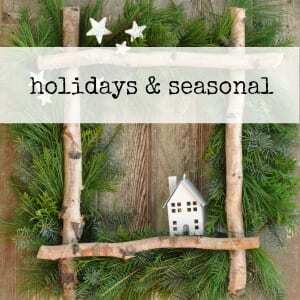 I’m working on getting the printables, I’ll see what I can do and get back to you. Hi Kim, The journals were picked up at Target, and she made the picture for the front with some clip art and “Viking” Font lettering. The “dragon’s tooth” is a bead from a local bead store. Best of luck with your party! Doing a party for my 7yo girl- thank you for the ideas. Was wondering if you had a chance to get (or get link to) printables…love the treat bags! Hi Laruan, This was my friends party, and she didn’t keep the printable files. 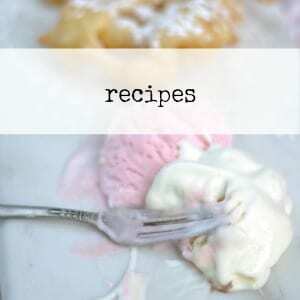 She made them with clipart and Viking font lettering, so you may be able to create something similar yourself. Do you know where she got the dragons that flew through the hula hoop? Hi Daiena, sorry I don’t know exactly where she got them, a toy store I think.